According to the United Nations refugee agency (UNHCR), there are about 22.5 million refugees in the world today. As world conflicts continue, this number is steadily increasing. In order to address this issue and to promote the integration of those who have been displaced, federal, state and local governments and non-governmental organizations (NGOs) provide services designed to assist refugees as they seek to rebuild their lives in a new country. In both the literature and in practice, a frequently discussed aim of these service providers is to help refugees become self-sufficient in their new communities. Given high demand and limited resources, they will often try to help refugees reach self-sufficiency as quickly as possible so that others may be served. However, self-sufficiency is typically viewed as an end goal rather than as a dynamic, multifaceted process. While a rapid push for self-sufficiency may allow the service providers to meet their goals and to turn their attention to newly arrived refugees, it also creates questions of if the refugees served are truly self-sufficient after assistance has ceased. Are they now able to live and work independently in their community? Or is additional help still needed? If additional help is still needed, what could be some effective ways to provide this help? When considering how to help refugees become self-sufficient, like with many policy decisions, it’s important to consider the long term. Yes, refugees typically require resources and assistance when they first arrive; however, they also make great contributions. According to some studies, seven years after arrival refugees are typically able to be self-sufficient and to fully give back to their communities. Unfortunately, newly arrived refugees are not always visible within the larger community and do not always receive ongoing support. If we want to truly promote self-sufficiency and inclusion that problem will need to be addressed. One approach to this issue is to focus on promoting self-sufficiency for refugees at the community level rather than at the individual level. In other words – create feelings of community among refugees and empower refugees and those who support them to work together to promote long-term self-sufficiency even after assistance from governments and NGOs has ceased. A focus on community-building and partnerships is also aligned with the UN’s 2030 Agenda for Sustainable Development. Of course, for such endeavors to take place we also must have the necessary human, financial and technical resources. Government funding for newly arrived refugees is typically short-term, about three-to-six months, with some additional grants for special communities (e.g. young refugees or older refugees). Many of the larger refugee-serving NGOs in the United States are funded primarily through restricted government grants, yet there also are smaller, local organizations (both faith-based and secular) funded primarily by individual donors, unrestricted grants and in-kind donations. Although their funding tends to be less, the unrestricted structure allows for more flexibility and more creativity when creating programs and providing assistance; these NGOs also tend to have large numbers of volunteers to help address the issue of human resources, especially in cases of faith-based organizations with large congregations from which to pull volunteers. These factors allow the programs to not only be able to adapt to the unique needs of individual refugees and refugee communities, but it also allows refugees and members of the receiving country community to begin forming relationships. In Burundi, for example, service providers have made a push for creating sustainable refugee communities (the term “refugee camp” is no longer preferred) that focus on inclusion with the larger community. This includes setting up housing structures in a way that promotes interactions between families and that provides for larger communal spaces (in this case, they used a U shape), creating facilities within the communities such as schools, hospitals and markets, and working to better integrate refugee communities into the community of the receiving nation. Others have created training programs aimed jointly at refugees and members of the receiving country community, with an ultimate goal of empowering refugees to be leaders and advocates with the support of other community members. These programs also help connect refugees to additional resources, and create a space for participants to begin networking and making connections. Some also include job training with a focus on technical skills, such as sewing, programming and gardening. Ultimately this type of program can allow refugee participants and participants from the receiving community to form partnerships and friendships, even after the support from any governments or NGOs has ended. There is no question that resources are limited, and that in all public sector work we should aim to use these limited resources wisely. We must also be sure to consider the human aspect, and to provide services that are in the best interest of our communities. 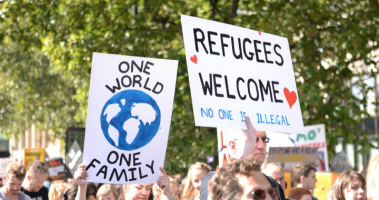 By investing in promoting feelings of community among refugee populations, and by moving away from the traditionally individualistic views of “self-sufficiency” and “success” that are prevalent in Western nations, we can help refugees to be self-sufficient, empowered and valued members of their receiving society.